Credit cards. Financial business background. 83% of Americans aged between 30 and 49 own a credit card. And it is estimated that there over a billion credit cards in circulation in the US alone. That works out at nearly 3 credit cards for every man, woman, and child in the country. With credit cards being so popular, banks and lenders are offering more and more incentives for you to choose their cards. But with such a crowded market, it can be hard to know which is your best choice. 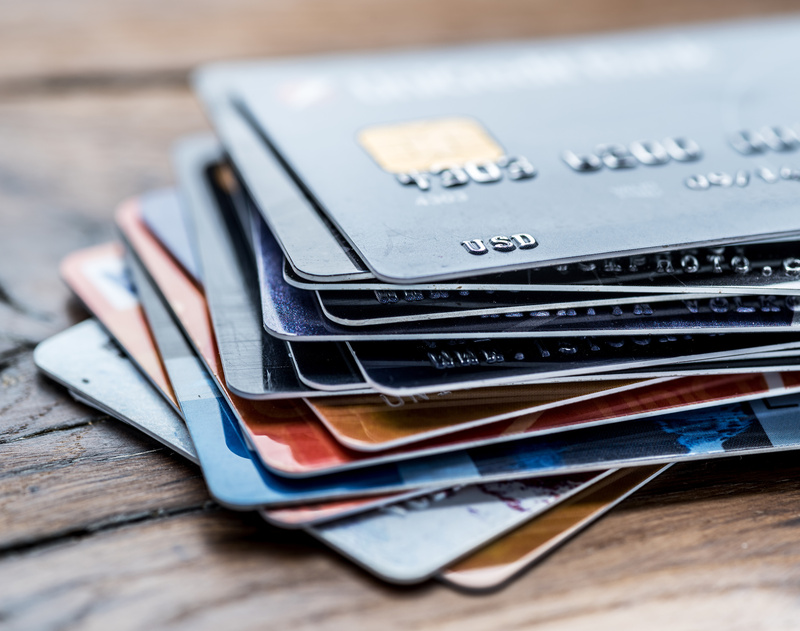 So read on as we take a look at the top ten credit cards for 2019. This is one of the very best credit cards if you’re looking for travel rewards. It’s simple to understand as it allows you to fly with any airline or stay in any chain of hotels with no complicated exclusions. If you sign up and spend at least $3,000 within the first three months, you will earn 50,000 bonus miles. You also earn two miles for every dollar spent. And if you book your hotels through Hotels.com, that rate rockets up to ten miles per dollar. The annual fee is $95 although it’s free for the first year. If you’re looking for a luxury card, you can’t go far wrong with the Platinum Card from American Express. It comes with some serious perks. You get up to $200 per year in Uber credit, $200 per year airline fee credit, complimentary access to over 1,200 airport lounges worldwide, and much more. All this comes at a price, however; expect to pay a $550 annual fee for the privilege. You also get 60,000 points if you spend $5,000 in the first three months. It is important to note that you need to pay off the balance in full each month. If you’re looking for cash back on everything you buy, then this card is a great choice. It offers 1.5% cashback on every single purchase you make. It also comes with zero annual fees and $150 bonus if you spend $500 in the first three months. There are also benefits including travel insurance, travel assistance, and extended warranty coverage. This is another great card if you’re looking for cash back on your purchases. It also offers 1.5% back on your purchases and comes with zero annual fees. And there is a $150 bonus, but you’ll need to spend $2,500 in the first three months. You’ll also get a 10% loyalty bonus on top of all the rewards you earn each year. If you’re interested in the range of cards that HSBC has to offer then check out this comparison from EnjoyCompare. Secured credit cards are great for those people whose credit history isn’t that good. You pay a refundable deposit in order to earn your line of credit and then if you use the card wisely, it can actually help you to build a stronger credit profile. The Discover it Secured card requires a deposit of $200 and this is one of the few secured credit cards out there that will actually give you rewards too. You earn 2% on spending at restaurants and gas stations up to $1,000 per quarter, which then reverts to the 1% you earn on all other purchases. And they will match the cash back you earn in your first year using the card. There are zero annual fees for this card. This is another great card if you travel a lot. You get 2% back on all travel and restaurant purchases, and 1% on everything else. And if you spend $4,000 on travel in the first three months, you’ll earn a massive 50,000 bonus points. There are also benefits including trip cancellation insurance and extended warranty cover. There’s an annual fee of $95 but this waived in the first year. If you like eating out, then this is definitely the card for you. You earn a massive 4% on unlimited dining and entertainment purchases, with 2% back at the grocery store and 1% back on everything else. And if you spend $3,000 dollars in your first 3 months, you’ll get $500 back. There’s a $95 annual fee which is waived for the first year. If you’re looking for a travel rewards card with no annual fee at all, then this is a great option. You earn three points for all spending on travel, dining, gas, rideshares, and even on popular streaming services including Netflix, Apple Music, Pandora, Spotify, and Hulu. All other spending earns you one point per dollar. You also earn a bonus 30,000 points if you spend $3,000 within the first three months. This is another luxury card with great perks and an annual fee to match. First off you’ll receive $300 back for any travel purchases made with your card each year. Any spending above that will earn 3% as will spending on restaurants, with 1% on all other purchases. You also get 50,000 points as a bonus if you spend $4,000 in the first three months. Other perks include complimentary airport lounge access, roadside assistance, and emergency medical and dental if you’re more than 100 miles from home. You’ll pay an annual fee of $450 plus another $75 for any additional authorized users. This is a great choice if you’ve got a large family. That’s because this card pays a massive 6% back on supermarket purchases up to $6,000 every year after which it reverts to 1%. You also get 3% back on gas stations as well as 1% on all other purchases, plus $200 back if you spend $1,000 in the first 3 months. There’s an annual fee of $95. And if you want to try to game the system, many supermarkets will sell gift cards that you can spend on whatever you want. Have You Found These Top Ten Credit Cards Useful? If you’ve found this list of the top ten credit cards useful then you’re in the right place. We have plenty more great articles on personal finance for you to enjoy. Whether you’re looking for information on saving money or taking out loans, we’ve got you covered. We also have more great content on politics, life, and more.